Istanbul Fast Foods in Hawick. A gang of racist yobs attacked a man in Hawick town centre yesterday, July 24, punching him to the head and body. The 35-year-old, said to be of Eastern European origin, was approached by a group of around nine males while standing outside the Istanbul Fast Foods takeaway in North Bridge Street at about 2am. 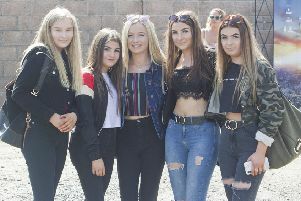 The gang of yobs directed what are described as racially-motivated comments towards the man, prompting him to try to get away from them by walking north along North Bridge Street. However, the group pursued him and again confronted him as he reached the junction with Dovecote Street. They then assaulted the man by punching him to the head and body, before running off. He was not injured in the attack, but police are today appealing for any witnesses to come forward. The assault is being classed as a hate crime. Police constable Ryan Anderson, of Hawick police station, said: “This was an extremely cowardly attack that caused significant distress to the victim. “The suspects carried out an unprovoked assault, and we are extremely keen to hear from anyone who was in the area of North Bridge Street in the early hours of Sunday and who may have seen these men. “Likewise, anyone who may have noticed this group in the area earlier in the evening is also asked to come forward. “Police Scotland treats all reports of hate crime extremely seriously and takes a zero-tolerance approach towards anyone involved in this unacceptable behaviour. Those with information are asked to contact police on 101 or the charity Crimestoppers on 0800 555111.